Set-up in 2007 to demystify accounting for freelancers/contractors and small businesses. From just £69 per month. 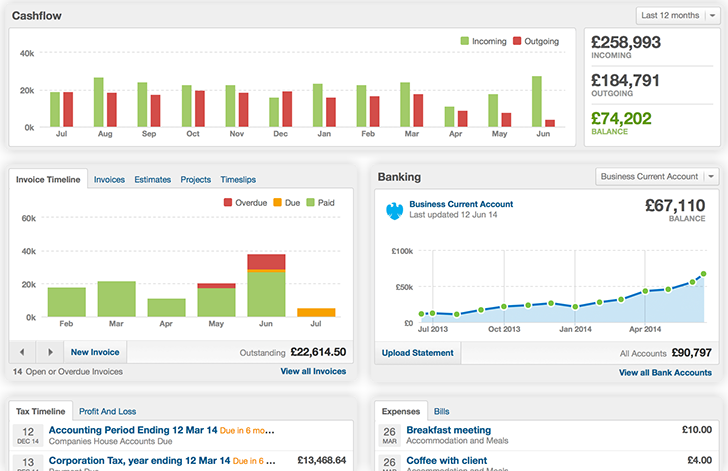 AccountingWEB Software Satisfaction Award Winner – For Small Business Accounts & Expense Management. We are an accredited FreeAgent Accountant. Highly recommended by users for the easy to follow dashboard & key info. Data and software stored externally meaning: No updates & No back-up. You access from anywhere/anytime with wifi/3G. This can be on your laptop, phone or ipad/tablet. Allows you to invoice & take payment immediately. We are there to provide support along the way and can both access you data. Monitor that you have more coming in than going out. Calendar of Amounts due and dates payable. See what you issued and more importantly what’s not been paid. Real time snapshot for the year to date. How much available to draw. Easy to follow Dashboard becomes the “Mission Control” of your business. Know at a glance how your business is performing. Real time information. Helping management of cashflow. Estimates, Time Tracking & Projects. Access FreeAgent whenever you need to. Auto upload and matching of bank transactions. Scan & upload expense receipts. Tax timeline helps ensure all key deadlines met. FreeAgent is ideal for contractors, freelancers and small businesses.